Panteón San Nicolas: Mictlarte and Arte Urbano as Mediating, Conservative and Future Oriented – Caitlin Frances Bruce, PhD. Panteon from above. October 2017. On October 31 IMJUV inaugurated a new project called Mictlarte. Drawing from the name of the Aztec god Mictlántecuhtli, who is the god of the underworld, the walls of Panteon San Nicolas were repainted during the month of October to represent images of local urban legends, pre-hispanic identity, and cinematic history. I documented much of the wall production, visiting the walls a few days a week for an hour or two each visit to take photos of progress, talk to the writers about what they planned to paint and how the project was going, and to observe interactions and reactions between writers and passersby. Chuen. Mictlántecuhtli and Goddess of Plants. October 2017. Part of the planning involved extensive digital mockups and a small design. When I met Dante at the IMJUV offices in 10 de Mayo, he was working in adobe design, figuring out the placement for the colorful orange and purple flowers that are so iconic of Día de los Muertos. The small 3-D model showed characters from Macario in bas relief, along with flowers and candles. He noted that the different projects that they are working on have different processes. 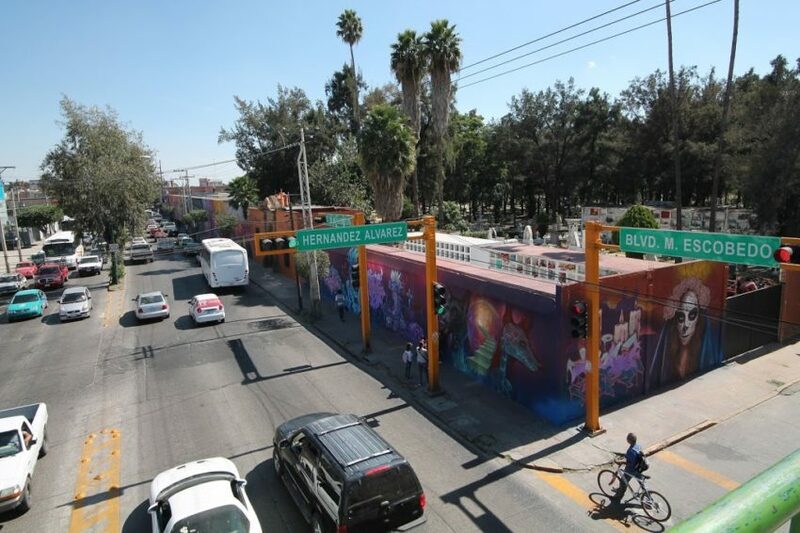 The Panteón project is more of a ‘proyecto ciudadano,” oriented towards a broader public, and Malecolor is more about a “proceso urbano”, oriented towards the graffiti community. Zanko and Onza creating grid. September 2017. JHard using airspray machine. September 2017. Brote’s Coatlicue outline. September 2017. Chuen creating outline for god figures. September 2017. Background for eastern portion of wall. September 2017. The team started painting the background for the wall the last week in September. The background colors were a mix of black, blue, orange and pink. The wall surrounding the cemetary is massive, probably a quarter kilometer long and about two stories tall. In the early moments of background painting the previous Katrina murals were covered with a thin layer of paint, making them yet more ghostly, with the term “Mural in progress” painted in small block letters along the wall. “Mural in process.” Quena, Zhot, JHard. September 2017. For all of October the team was at the wall most days from 1pm to 7pm. Situated on Boulevard Mariano Escobedo, an extremely busy corridor for the city, the wall is a space of intense noise, car exhaust and dust, and strong sun. While the writers painted, a number of pedestrians and bicycle riders would rush past, streaming around or under scaffolding or ladders. Some would turn their heads to glance at the wall in curiosity, some pushed past in frustration. Zanko and Mersi holding court. October 2017. Panteon San Nicolas, Interior. October 2017. Panteon San Nicolas. Interior. October 2017. In late September the team divided up the wall into different quadrants using a tool that has a string covered in blue chalk—when you hold the string flush against the wall and then flick it, a faint straight line is left behind. Small numbers were written in the quadrants to help the artists match up the proportions with the physical wall and their digital/printed design. The wall was covered in broad swathes of paint using an airspray machine hooked up to a generator that would create lines four to seven feet thick. JHard was the primary user/director of the machine, filling one entry way with water, another with paint, or occasionally pulling rubbery strands of congealed paint from the entry nozzle that the filter surrounded. In addition to creating a grid on the wall, the Muraleón team began marking outlines for the primary figures in the mural: La Llorona, the Brujo of San Pancho, Vincenta, Mictlantecuhtli and Mictecacithuatl, among others. La Llorona is a legend about a mother who drowns her children in revenge against her husband, and kills herself, but remains a ghost, crying and looking for her children in the river. The Brujo of San Pancho is an urban legend from León that chronicles a witch who was raised from the dead by the devil in León’s historic center. Vincenta, or La Novia, is the story of a young woman about to marry who dies in a flood and is seen to wander the streets of León, searching for her lost fiancé. , Mictlantecuhtli and Mictecacithuatl are, respectively, the god of the underworld, and the goddess of plants. La Llorona. Quena. Leon, GTO. 2017. Making the outline required relying on the grid system, a translation of the digital sketches, but also running across Mariano Escobedo to the median to get a larger look, or having a colleague stand away and yell directions, as Zhot did while Quena outlined the arms and hands of La Llorona. Her section of the wall was tricky because the head of the figure was on the top of the wall that is on a 45-degree inward gradation. Brote and Zhot, per usual, have completed their pieces early, Brote with his iconic woman with a star on the head, and Zhot painting a sleeping woman surrounded by curlicues and flowers, somewhat like the Virgin Mary, but perhaps not. In addition to pre-hispanic figures and skeletons or skulls, there were a plenitude of candles (velas) and marigolds in purple and orange. Dafne painted Azolotl, a god who was so afraid of death that he was condemned to stay in the body of a small sea creature. Crook painted a nahual, a kind of hybrid lizard/goat creature. JHard painted a portrait of his late grandmother. Lolis paints a Catrina. Truko paints his name with a cemetary background. Gryz painted three skulls, that of a human, a dog, and a cat. Enter painted a skull. Puerk painted an owl. Chuel working on god of the underworld. October 2017. Uriel working on La Novia. September 2017. Zhot working on burner next to sleeping woman. September 2017. Brote working on Coatlicue. September 2017. Chuen at work on god of underworld. October 2017. Dafne finishing up her Ajolote. October 2017. The core Muraleón team was joined by other writers, illustrators, and street artists, contributing to a final wall that offered a diverse range of styles, mediums, and approaches. For instance, Drunk, of BR crew, painted an image of a woman aging, four faces from childhood to death. Mau, an illustrator, painted a kind of monster figure. Kiers painted a geometric letter based piece. Gogue a curving letter piece. Biers does his gothic letter calligraphy creating concentric semi circles: “El muerto no existe la gente…siempre estoy contigo.” Ear painted an Aztec warrior on the inclined upper wall near the gates. Around 40 artists in total painted the wall. Zefor painted a kind of goblin figure. Mane Aerografica painted a Katrín (a male Katrina) with lyrics to a popular song, “La vida no vale nada.” Alex Maraquez painted a calligraphic skull with two yellow circles. Biers CK’s gothic letters. October 2017. Aztec warrior by Ear. Leon, GTO. 2017. Katrin by Mane Aerografik. October 2017. Artist from San Luis Potosi. October 2017. In mid-October work began on the Marcario section of the wall, using the airspray machine to paint the middle of the wall black with blue fades through it. The scenes depicted are where Macario shares the turkey with Death, and where he tries to grab the candle with the flame of his life from death, and where he sits on the edge of the bed where his child is deathly ill. What is novel about this section of the wall is that the faces of two macarios and one Death are done in bas relief with plastic housing material cut into the outlines of the heads and mounted onto a metal apparatus welded by Crook on site to make the heads flush with the bottom part of the wall, away from the 45-degree lip of the upper wall. This quasi sculptural/architectural intervention gives the works more dimensionality. Kart and Dante planning bas relief. October 2017. Digital sketch for Macario panel. October 2017. Outline for figure of death for Macario panel. October 2017. Ardhe working on Death figure for Macario Panel. October 2017. Figure of death in Macario panel by Ardhe. October 2017. Welding supports for bas relief. Leon GTO. October 2017. Installing bas-relief Macario head. Leon, GTO. October 2017. Macario in progress. Leon, GTO. October 2017. Zhot working on Macario bas-relief. Leon, GTO. October 2017. Ante completing section of Macario panel. October 2017. Because the project took over a month, observations included not only progress on the wall, but ongoing interactions and reactions from passersby. At times, particularly after school lets out, or on weekends, small crowds would gather and eat snacks while watching the painting. On Saturdays cars slow to watch the painting. At other times pedestrians would provide direct feedback. “Good job,” directed to me in accented English, some one remarking “eso es arte, güey!” “this is art, man!” and little kid shout “Mira!” “Look!” to their parents. Child observing mural in process. September 2017. Pedestrian observing Chuen’s piece. October 2017. Sleeping woman, La Llorona, Mask, and burners by Mariano Escobedo bus stop. October 2017. Gogue. Leon, GTO. October 2017. East side of Panteon. October 2017. Detail for Zanko’s mask. Leon, GTO. 2017. Altar by Crook. October 2017. Flores de naranja and portrait of JHard’s abuela. Leon, GTO. 2017. Zanko working on Japanese style mask. October 2017. Siter’s Katrin, Gryz’s dog, cat and human skull, Kiers’ production. October 2017. JHard at work on portrait of his abuela. October 2017. Zhot’s sleeping woman. September 2017. The inauguration of the project also demonstrated how officials use such art projects to forward large political/ideological goals. Within the path of the Panteón about 100 chairs were set up facing a large vinyl poster that said “Presentation of the Mural Mictali Panteón San Nicolas” with a faded image of the mural below the text, and chairs for officials. On the left side of the “stage” was a clearing near graves with mirrors, bouquets of flowers and lit candles in colorful votive holders, as well as the vertical self-standing signs that listed all of IMJUV’s programs. Brote’s Coatlicue and Crook’s Nahual. October 2017. Most of the artists who had participated in making the mural stood on the sidelines, some very dressed up, in button down shirts and oxford shoes, or others simply in jeans and a sweater but without paint marks. Reporters from Canal 4 interviewed Dante and Lalo. There were about 140 people watching the opening, a more mixed group than earlier IMJUV events, including families and youth (about 50 or 60 youth in Halloween costumes). Inauguration venue. October 31, 2017. Stage area, inauguration. October 31, 2017. At 5:15 there was a rush of activity as the mayor, the director of the advisory board for IMJUV, and the director of city grave sites, the new director of IMJUV entered the gates, surrounded by a cluster of helpers and press. As with many of the IMJUV events it was MC-ed by a disembodied announcer who cued the different shifts in the events. After the dignitaries took their seats, joined by Kart as the representative of the artists, the announcer welcomed us to the event and explained that it would begin with a short act of theater. Macario scene of inauguration. October 31, 2017. Moody music played and a young man in a Macario outfit and face painted as a calavera or Katrin entered, and a young woman in a wedding dress, face also painted as a skeleton. There were some giggles. The woman introduced herself as La Novia, Vincenta, who was feeling nostalgica for being separated from Manolo, her fiancée. Macario tells her “The dead must not feel sadness, but remember with love.” Vincenta told the story of her tragic death in a flood when something fell on her and she drowned in “agua fria”, and then her lover’s suicide. Uriel. La Novia/Vincenta. October 2017. The announcer then told us to applaud the actors, and then presented the dignitaries. In addition to the mayor, and the director of the Consejo for IMJUV was the director of the Gender Institute for the city, a representative for business programming, the director of the Leon Cultural Institute (ICL), Director General for City Health. Importantly, Kart was introduced as an “artista urbana,” an “urban artist” a denomination that has gained in popularity not only in León but across the republic. The new director of IMJUV, Misraim Macías, opened with a short statement. In this statement, Macías forwards the role of “arte urbano” as key to celebrating and remembering local and national iconography as a means of solidifying identity. Linking past to present, and speaking to multiple generations, he figures youth as central to the work of identity creation and celebration: youth as central to futurity. Kart delivering speech. October 31, 2017. In Kart’s presentation he privileges the process and dialogic encounters as the artists developed the concept and later on, the work. They came up with themes in conversation (however vague) with residents, understanding the site to be the collective property of Leonese people. He also points to the expansion of what countsas arte urbano, moving from spraypaint to other techniques including brushes, pens, etcetera. It also is evidence of how the artists themselves work to control the frames and meanings of their work, positioning themselves as intermediariesbetween the government and the population, interpreting into images what identity is and does. After Kart’s speech there was another break for theater where the Devil has an argument with Death, and the Devil tells the story of the Brujo Funerario of 20 de Enero Street (this was the section of the mural that Ardhe painted). Macario also told his tale. Death concluded the scene by remarking to the audience that “such stories as these, of death, become legends, and give life to this beautiful city and pass from generation to generation.” Then the song “No vale nada la vida, la vida no vale nada,” played. “This project is part of our commitment to Leon…thank you to Victor and the artists and your commitment and all of your commitments. In you we see the great possibility for the transformation of Leon.” He thanked Esquivel, the work of fellows of cabinet, and in a “very special thanks of a CEO and friend, Jorge Succar, many thanks” he said “for the government its important what we are presenting. First, our municipality is in a stage of transition and change. As a government, we don’t come to administer problems—we look to create a change in ourselves, [by devoting] our attention…[to] our children, our youth and our women. With all respect for men of my generation we are not focusing as much attention [on this cohort], we attend to all, but our energy is focused on children, youth, and women because it represents a great opportunity to change León. The León we have is not the León we want. We have a great opportunity…to create a León we want. We resist living in a León that excludes, is unequal… many of our efforts are focused on youth because naturally they are noncomformist, for naturally they dream, and for their conviction…and we don’t look to repress or judge them, we are not judges, as a government we want to take advantage of their energy…this energy is expressed in art, in painting, in sports, in music, in a constructive manner, in a way in which we can transform ourselves and construct and construct a León of our and their dreams…this here provokes a change. As Victor explained, the process is not simple. First one must imagine it, and then create/paint it in a drawing or an idea. And later, the great challenge of the creative process is to convince other to participate in it. And the most interesting is to convince them to do a project not based on individuality but to achieve a work that is not only important in Leon, but at a national and international level. How do you create a creative process without losing our identity? Conserving our identity? We don’t want our artistas urbanos are a bad copy of foreign cultures. What we want of this project is that we are proud of what we are, proud of our land, of our name, of our legends, of our traditions. That today have graciously been represented. We need to assure ourselves that we will always conserve…you continue this project passing from generation to generation so that we never lose our identity to be Leónese, Guanajuatense or Mexican…this is the great challenge of what we see installed outside. How do we construct a world, Leon, Mexico that is modern in an emblematic space? How do we motivate this process of transformation remembering where we come from? How do we develop a modernity that strengthens our roots? In this speech several things are at work. First is the idea of youth as a kind of natural resource: as energy, political potential, vision. This biopolitical language of maximizing potential, and life, is one that is prevalent in previous youth institute events. The language of the “natural” visa a vis youth is also in tension with recognition (also becoming ‘common sense’ in IMJUV disoucrses) that there are diverse youth culture. Second is the idea of inclusion, “plurality and diversity” positioning the government as benevolent partner who “provides the brushes” but is not the primary actor. Rossanna Reguillo has argued that in practice such inclusion manifests as “unequal inclusion” insofar as some are included more than others, or only up until a certain point. The inclusion of artists and youth seems to be implicitly based on the extent to which youth can build a better León, both in the materiality of urban space and by shaping cultural imaginaries. Moreover, inclusive exclusion thrives in the context of neoliberal governance wehre the government’s welfare function is hollowed out. We might ask, to what extent are projects like this compensatory for a largely withered social welfare state (estado benefactor) outsourcing infrastructural responsibility to the population, and corporations. Third, is the idea of tradition and conserving it, positioning youth as the custodians of the past. Fourth, is a tacit anxiety about being “bad copies” of other “urban artists” and the imperative to create something unique and specific, that is as much inward looking as it is outward looking. Fifth is using this to straddle the difficulty of modernity. The mural serves as metaphor and model for how to liberate energy, include different identities, conserve tradition and celebrate it, and create a unique model of Leonese identity that is well positioned to confidently stride from the past into the future without losing sense of self. Chuen leading part of mural tour for Mayor Santillana (Center). October 31, 2017. Ante explaining Macario panel to Mayor. October 31, 2017. Preparing for group photo by Lolis’ Katrina. October 31, 2017. After the Mayor’s talk the aunouncer signaled applause and invited everyone to join the Mayor on a tour of the mural. A huge crowd moved down the street, part of the street was closed, and first Dante explained parts of the mural: the Katrin of Siter, who wasn’t there; then elements of Macario; then Dante pointed to Crook’s Nahual, and then La Llorona of Quena. The press proceeded ahead and backwards to get photos of the explanation, then they went back west and Chuen explained the two gods he had painted, of the Inframundo and the Goddess of Plants, and then Brote explained the two dogs, the Puento Arcoiris. There were postcards made of the Puente Arcoiris by Zhot and Brote, the Brujo of San Pancho by Arde, of Mictlán by Chuen, the god of the inframundo, of Vincenta by Ante, and these were given out. When we rached Lolis and Truko’s part of the wall, near the stairs, the Mayor asked the artists to sign the cards, and later Misraim communicated that the Mayor would have the cards placed in the Municipal Archives. “this, I think, is a great achievement” he said to the Muraleon crew, who responded with cheers and whoops. It was an extremely exciting moment for the artists to receive such robust recognition of their work, and there were many spontaneous hugs and hands on shoulders and shouts, mobilizing separate conversations and dreaming about future projects. 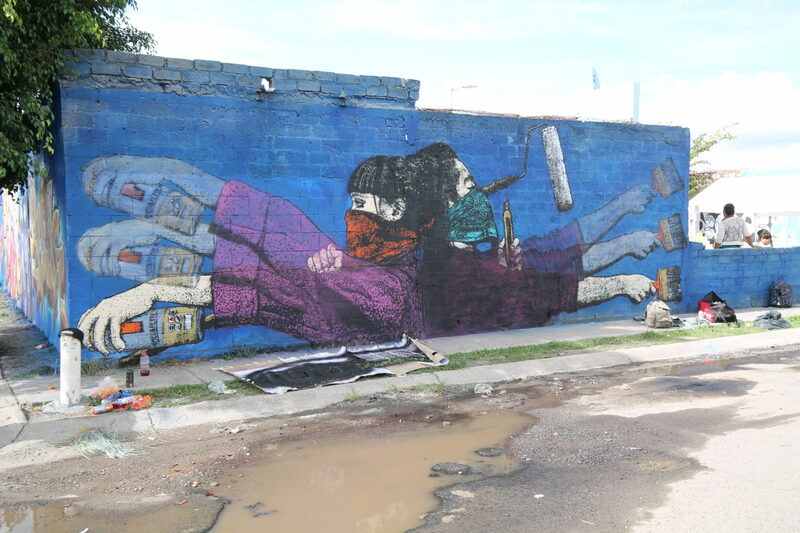 The mural was documented in the press as well, appearing in articles in Milenio, El Sol, NoticiasLeón, El Heraldo, Plaza Principal, Bonito León, and others, and in little videosfeaturing Quena and JHard on the Leon Joven website. This event which functioned as a moment of official recognition is important. It signals the municipality’s attempt to integrate “arte urbano” into crucial organs for local history and identity. Moreover, it demonstrates how “arte urbano” can be used as a metaphorical resource for reimagining the “urban image,” but also how artists are learning to situate themselves and establish sometimes competing or different frames for understanding the importance of arte urbano as a means of public communication and civic voice. Muchas gracias a Muraleón y las otras artistas para sus historías y para permitirme documentar este proyecto. Este proyecto es hecho con apoyo de Fulbright Garcia-Robles/Comexus y el Universidad de Pittsburgh/CRDF.